With this announcement, Baptist World Alliance President John Upton officially declared the start of the 21st Baptist World Congress in Durban, South Africa, on July 22. Keynote speaker Peter Chin of South Korea said that because the world is filled with so much darkness, it is imperative that Baptist Christians shine the light of Christ. Chin declared that the darkness affecting humanity is reflected in suffering, death, ignorance, discrimination and abuse. There is also darkness, he said, in the levels of deception and political corruption and oppression that exist. Economically, darkness is demonstrated in the levels of greed, poverty and debt that are so prevalent. He stated that the light of Christ serves at least two functions. It eliminates darkness and it illuminates what is hidden. Every Christian should “shine the brightness, the warmth, and the light of Jesus to the world he loves,” Chin announced. Video of the opening night’s celebration may be viewed on the BWA website at www.bwanet.org. The congress, which has as its theme, “Jesus Christ, the Door,” continues from July 22 to 26 at the International Convention Center in Durban. 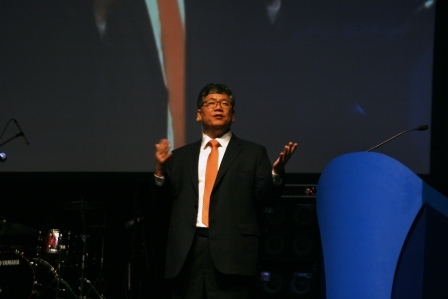 Peter Chin of South Korea delivering the sermon at the opening celebration of the Baptist World Congress in Durban, South Africa. Previous post ← Millennials and the local church: Membership or belonging?